die Collage ist mal wieder wunderschön! Ja, Aprilwetter ist sehr passend. Bei uns hat es heute Nacht wieder gefroren und ich durfte heute Morgen Eis kratzen, grrrr... Der Becher ist ja klasse :-))) Mein Lieblingsfoto ist aber das Himmelsbild, das finde ich, trotz grau, richtig genial! Ich wünsch Dir einen guten Start in eine wunderschöne und glückliche neue Woche! I like them all, but the cat is my favourite. We've had a tiny bit of snow last thursday :-( I'm hoping for sun! My human loves that cat mug! Die Collage passt wirklich zum Wetter :-)! I'm so tired, I need sun!!! I wish we had rain instead of snow. Getting more of it today, but then it's FINALLY going to be above freezing again later in the week. aww... this moodboard is so doom and gloom. It hasn't been raining but we just got hit with a snow storm and so the snow is slowly melting and it's looking like dirty snow now. Awww! Our weather stinks to, except it is snow along with ridiculously cold temperatures! It has been a tough season across the globe it seems. This moodboard is quite appropriate! Love this moodboard and I completely identify with the cat as well! This moodboard is so perfect!! We finally have sunshine today and it sure lifted my spirits! The question is, how long will it last? Ich bin hin und weg von der Tasse *_* Bei solchen Dingen geht mein Herz auf! Liebe Duni, ich wünsche Dir einen wunderbaren Abend und schicke Dir die allerliebsten Grüße! Dein GlamourGirl! The cat is too funny! I'm really de-motivated by all the rain I've seen recently. So far I've been awake for two hours and all I've done is sit around and read! I guess that's okay every once in a while, but I feel like I need to do at least something useful at some point today. Bei uns war es heute mild und es gab auch ein wenig blauen Himmel zu sehen...zum Glück. Ich kann den März kaum erwarten....der Becher ist allerdings klasse...armes Kätzchen...schnief! Very nice mug. You can never have to few mugs. Rain would be a welcome change of pace here. We're STILL getting mounds of snow! I always enjoy rain picks. The mobile is my favorite here. Our weather has been kinda crazy too. Snowed two days in a row, but wound up with highs in the 40s and almost 50s! Well Vancouver has a reputation for being dreadfully rainy and the weather is living up to its reputation, I'm afraid! Love your collection here. Stay warm and dry! Great finds, Duni! Sorry you had such a soggy weekend. Love the cloud and crystal mobile and those cute little umbrella earrings! We've had so much rain lately too. I'm ready for spring! 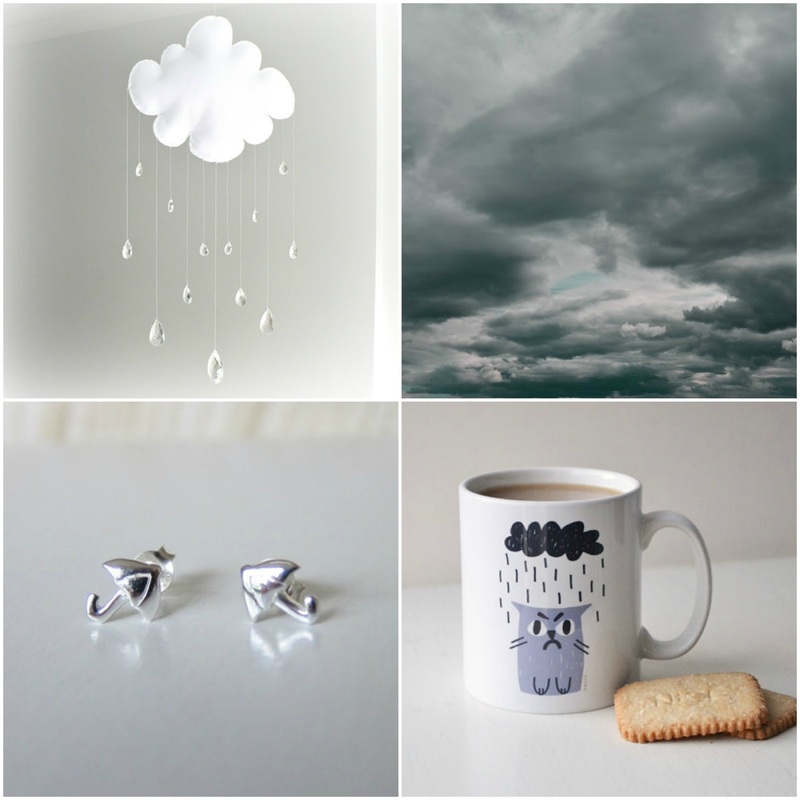 Love the kitty mug and also the cloud! Ein phantastisches Moodboard, ganz passend zur aktuellen Wetterlage. Prima. It was definitely like this in London this week - weather like does affect my mood and I found myself sluggish, sleepy and unmotivated at times. Here's hoping spring is on its way! Hope you had a lovely weekend! Have a great day ahead Duni!